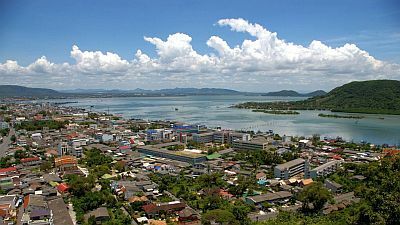 In Songkhla (or Singgora), a city in southern Thailand, the climate is tropical, hot and humid all year round, with a rainy season due to the monsoon, which lasts from May to January, but has a pronounced peak between October and December, ie in the period of the "retreating monsoon", while from June to September, and usually also in January, the rains are not too abundant. In the short dry season, from the middle or the end of January to April, some showers are still possible. Precipitation amounts to about 2,200 millimeters (87 inches) per year. The rains are particularly abundant in the last months of the year, since it is the period of the northeast monsoon (or retreating monsoon), which directly affects the coasts exposed to the northeast, that is, the eastern part of Peninsular Thailand. Typically, the worst month, with real torrential rains, is November, but sometimes they can occur also in October, December and the first part of January. The temperature is high throughout the year, however, it's slightly lower from November to January, when highs hover around 29/30 °C (84/86 °F); the heat is annoying because of humidity, and also because behind the town there is a plain with some lakes (which are actually lagoons), which provide additional heat and moisture. From March to October, there can be hotter days, with peaks of 35/37 °C (95/99 °F). Luckily, sea breezes blow. The amount of sunshine in Songkhla is good from February to April, that is, in the driest period, while in the rest of the year the sun shines quite often, but it alternates with some cloudiness, more or less widespread, and associated with rain showers; from October to December, that is, in the wettest months, there can be more prolonged cloudy periods. Songkhla, like other areas of Thailand, can be affected by tropical cyclones, in particular typhoons coming from the east, which in recent decades have entered the Gulf of Thailand only from mid-October to about 20 December, although being the sea always warm, it can not be excluded that they can also be formed in other periods. 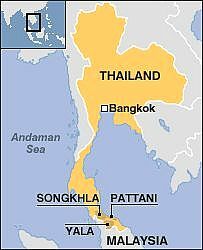 Anyway, the Gulf of Thailand is a relatively sheltered area, since it lies halfway between the Bay of Bengal, where cyclones are formed, and the South China Sea, where typhoons arrive from the east, and normally pass to the north, directly affecting mainland Thailand. The sea near Songkhla is warm enough to swim in all year round, as you can see in the following table. The best time to visit Songkhla goes from late January to April, since it's normally the least rainy period, with a preference for February because it is, albeit slightly, the least hot. In January, depending on the year, the rains may be more or less abundant, in particular in the first half, when at times they can still be torrential. In summer (in June, July, and August), there can be long periods without rain and with intense heat and highs around 35 °C (95 °F), while at other times there can be showers, more or less intense, almost every day.